Securities industry professionals seeking to transact securities business with residents in most states as a broker-dealer agent are required to pass the Uniform Securities Agent State Law Exam, more commonly known as the Series 63 exam. 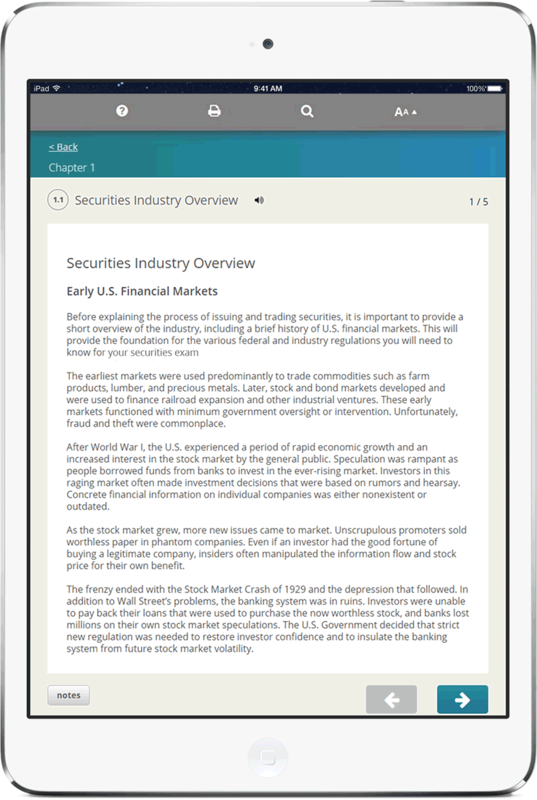 This exam is developed by the North American Securities Administrators Association (NASAA) and administered by FINRA. This requirement is in addition to passing a FINRA representative-level exam. Securities agents looking to obtain a Series 63 license must have entry-level knowledge of the state securities regulations, ethical business practices and fiduciary responsibilities. This course will deliver the content needed to successfully complete the Series 63 examination requirements. The Uniform Securities Act of 1956 (USA), NASAA Statement of Policy and Model Rules, state registration and regulation of nonexempt persons, state registration of nonexempt securities, unethical and prohibited practices, handling of client funds and securities, and administrative procedures.